Is Mingle Cash A Scam? – Where Are The Cash? How does earning at least $57 a day sounds to you by using the Mingle Cash system? If you are looking to earn some extra income you will find this as a good way of giving your income source a boost. However, you might be wondering whether this kind of a scheme will really work and can realistically earn you this amount on autopilot. Mingle Cash is a relatively new program that claims it can help you earn money by offering realistic opportunities to boost your income without really spending for an investment. Is Mingle Cash a scam, you will probably ask. Let us see what we can find out from this program and see whether it is worth your time and effort. Mingle Cash is just another website that offers income opportunities by offering different ways to earn through a get paid to do system. It claims that you can possibly earn $57 a day from using its system and this is not the maximum amount that you can earn along the process. The best part about its program is that it is free and it boasts how it can provide you passive income opportunities without the need of cashing out some money as investment. So where do you get the cash from Mingle Cash? Its website claims that you can do this by simply surfing the web, do simple tasks and making some referrals. As a get paid to do system, Mingle Cash will help you earn some money by completing tasks like viewing ads, playing games, watching videos, do some searches on Google, download apps, completing surveys, referring others to use the system and completing offers. Different tasks will earn you different rates as payment and do not keep your hopes high on the amount since they usually pay very cheap. You can possibly earn $0.01 by making Google searches using the Mingle Cash browser. You will be asked to download its browser after signing up a free account from Mingle Cash. By using its browser you will have the chance to do some tasks by seeing different ads like banners, pop ups, video ads and contextual ads. You have control from its settings how often you want these ads to show up from the browser. You can also earn by playing videos for about 90 seconds. However, you have to watch the video ads that run about 30 minutes before the game starts in order to get credit. The rate for this task depends on the country where you are in with the US and UK having the highest rate of $0.005 for every game played. Other countries pay a measly $0.00005 for every game. By participating in surveys, taking offers and downloading applications you will likely earn more. This is found in the Offer Wall from the site and this program partners with companies like AdgateMedia, Offertoro, AdscendMedia and persona.ly as among many others. These tasks pay from a few cents to $3. The highest paying offer from Mingle Cash is through its referral program where it claims you will earn 5% from your referrals’ income by using your referral link. 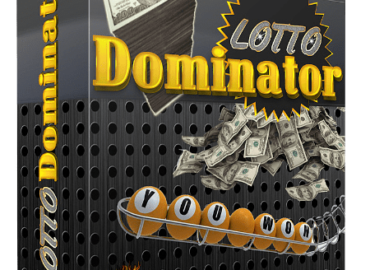 You will also earn additional 5% commission up to 10 downlines. Becoming a member of Mingle Cash is free so it is quite safe to say there is no harm trying from using this program. An eBook is provided that can help you maximize your earnings by learning how you can promote Mingle Cash more productively. It also has 10 tier referral programs which gives you more opportunity to earn. Not all ads from Mingle Cash are safe. You will find some tasks asking you to download applications which are marked as fishing URL. Some will be flagged as a program with malware and adware by your antivirus program. There are no definite terms and conditions and privacy page from Mingle Cash. This should make you feel quite uncomfortable since you will be participating on a site without any assurance on the protection it gives to your account and activities. The earnings from Mingle Cash are not reliable or decent enough or worthy of the time and effort that you spend for doing tasks to get paid for. 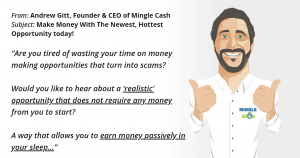 Is Mingle Cash a scam? It is difficult to say for sure since there are no complaints regarding non-payment from the site. However, there are sufficient reasons to believe that some of its tasks and advertisement are not safe. The pay for the tasks is not something one should look forward to considering you earn very minimal and you need to get more referrals to enjoy commissions. Considering the pennies that you can earn from the tasks it is unlikely that the program is sustainable to keep your referrals do more tasks in the long term which affects your potential income from the program. Is Paid2YouTube A Scam? – Got Time To Watch Youtube? Is Cash From Home A Scam? Is 7 Day Cash Money a scam? You will be giving away your cash instead. Is Facebook Cash Code A Scam?